They have a rather unfortunate name, although I admit I like asking people if they want some of my Raw Nut Balls. They elicit quite a reaction. Forgive me, I can have a naive sense of humor. Let the puns begin. Trust me I never thought there would come a time when raw balls would be so trendy, but alas! So, I made these for the first time over the weekend, and they are off the chains delicious. And, just one or two can cure a bout of a hunger, no joking. Now, I have told you before that I rarely measure, so if you need exact measurments you might have to go look elsewhere. But don’t say I didn’t forewarn you that god knows what will show up in a google search for raw nut balls. I searched several different recipes, before deciding the base was relatively the same in all of them, so I just winged it. I knew I wanted something with a lot of vanilla flavor. So basically, I threw some almonds (maybe a cup) into my food processor until it resembled a course ground powder. Then I processed some pitted Medjool dates (about 9-10) with a generous amount of vanilla, until a sort of paste formed. Then I incorporated the two, mashing with a spoon until it was combined. 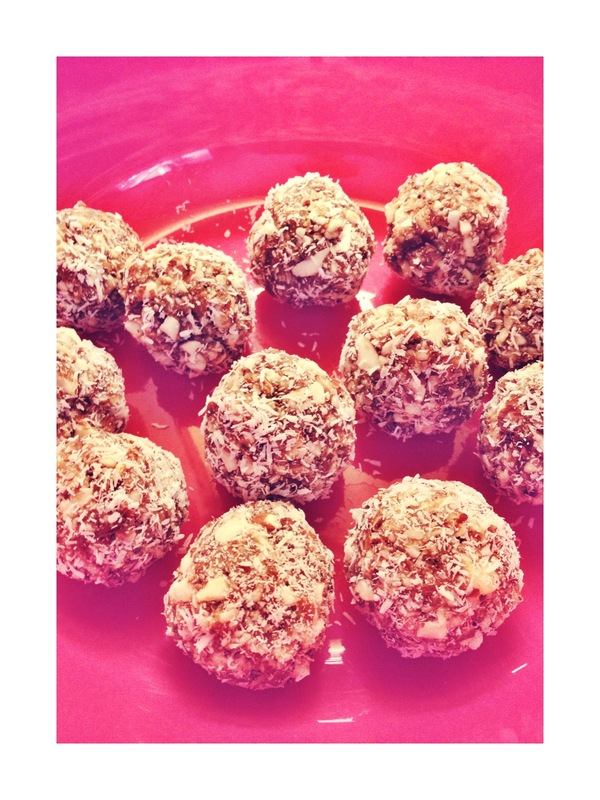 I added some salt and organic unsweetened flaked coconut to it, as well as some chia seeds to amp up the nutritional boost, then rolled into balls, and tossed in some more coconut. Yum! These are such a great snack, and vegan too!